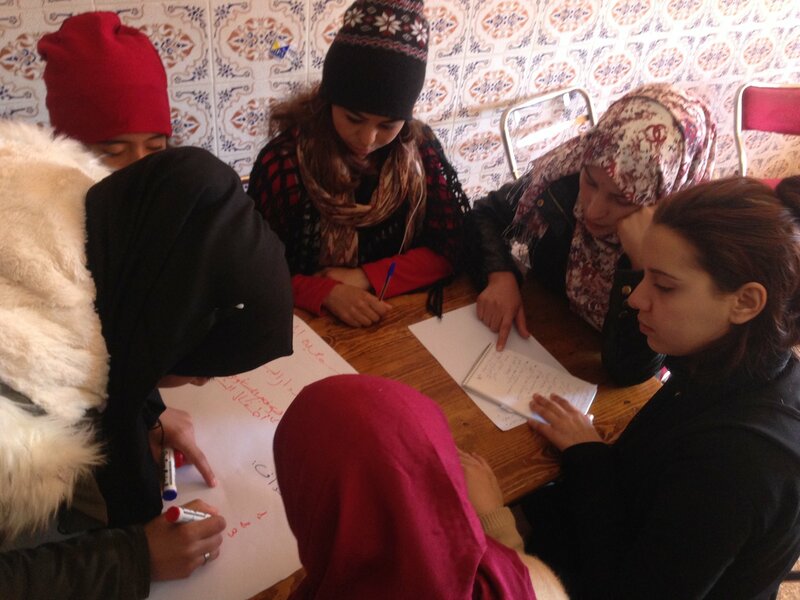 In Morocco, #ExchangeAlumni are empowering young women to make a positive change within their communities! The #AEIF2017 project “Empowering Female Agents of Change” is focused on helping the next generation of female Moroccan leaders understand the importance of community engagement and to teach them new civic and leadership skills. Empowering women was especially close to the hearts of the Professional Fellows Program exchange alumni who created the project: they sought to put into action the adage that when you give women and girls the tools to succeed, they not only improve the well-being of their own families, but the stability of their communities. To create buy-in from the community and to build a support network for the girls, the Association Regional Union des femme du Maroc hosted an opening ceremony to inform people in the Azilal-Beni Mellal Provinces of the upcoming workshops. The ceremony was attended by community leaders and by women who were interested in participating in the project. The Association then teamed up with five local non-governmental organizations that served as host locations for the workshops. Each site had five half-day workshops, each with 15 to 18 participants. Session topics ranged from self-confidence and entrepreneurship, to life skills and leadership. At the end of each session there was an opportunity for participants and trainers to discuss leadership techniques and approaches that could be used to talk with other girls within the participants’ communities. Project coordinators built mentorship into the program; exposing the participants to role models who overcame the obstacles of a male-dominated culture. After the initial sessions, 30 girls were chosen to visit with two successful female leaders in the Azilal-Beni Mellal Provinces who shared their experiences, struggles, and triumphs. After the meetings, the participants completed a month-long internship with an association or cooperative within their local communities. The participants then wrote a final report which included a reflection, a future action plan, and a space for feedback and suggestions. The 30 participants presented their reports to each other at a seminar event which allowed them to utilize the skills they acquired during the training workshops. The impact of this project was vividly seen within the province, as participants of the program discovered a strong sense of community and a passion for leadership. This impact manifested in the participant’s creation of the Facebook group “Tomorrow She Leads.” The participants created the group to continue serving their local communities and keep the strong bonds of their newly formed network. Upon completing the project, some participants left with a strong desire to create their own small business enterprises to help improve their financial situations. The “Empowering Female Agents of Change” project was able to help form new female leaders of Morocco that are eagerly and actively engaged in their communities. Are you inspired by the Empowering Female Agents of Change project? Now is the perfect time to sign in to your alumni.state.gov account, find your AEIF team and submit a project on Empowering Women and Girls. Don’t wait! Applications can be submitted starting on February 1.